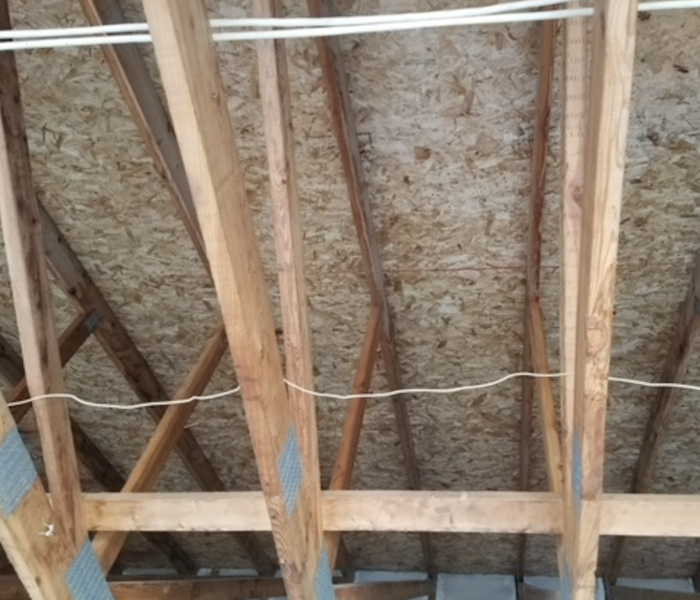 This home suffered from a water loss causing the ceiling and drywall to be removed and replaced. SERVPRO of Wright County responded immediately to begin clean up. The air mover was put in place for efficient drying and prevent any future damages. The attic space suffered from a mold loss. 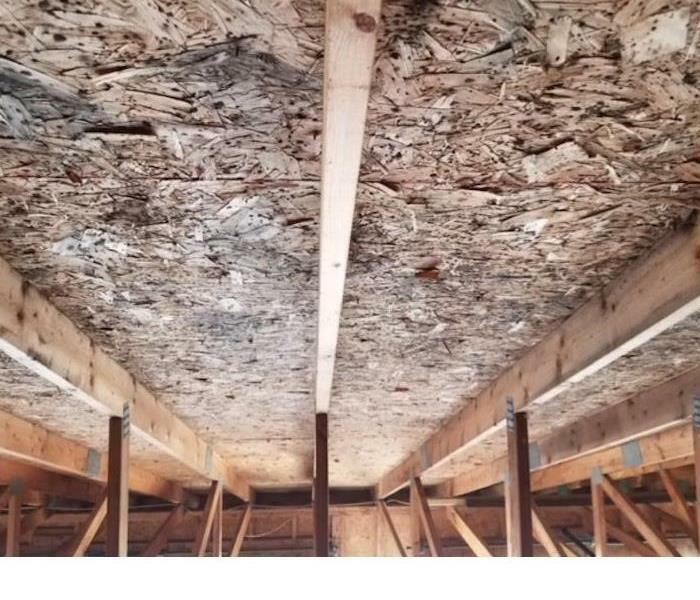 There was mold found on the OSB and trusses. SERVPRO responded immediately and was able to remove the mold with cleaning techniques and solutions. 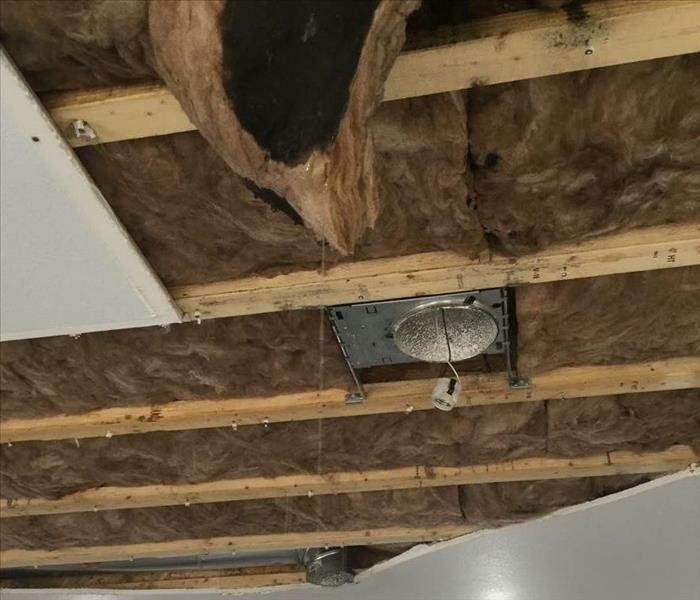 This ceiling suffered from water damage from a severe storm after hitting the area. The storm waters had leaked from the roof. 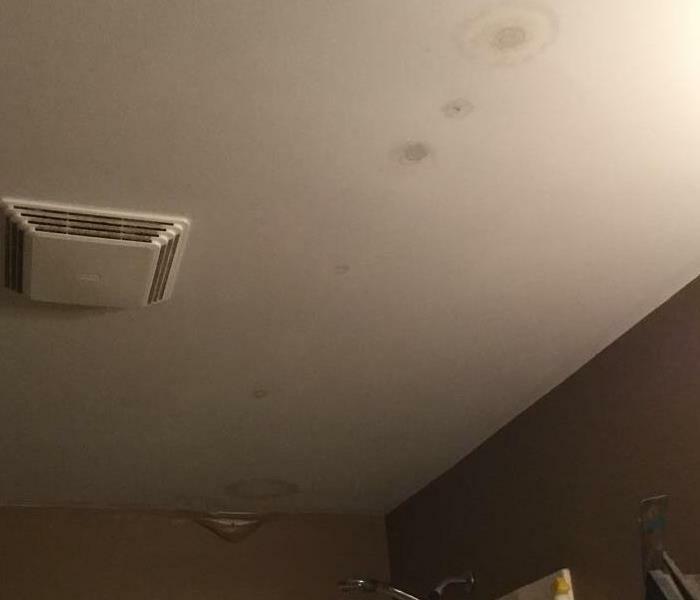 The water had stained the drywall not the ceiling. 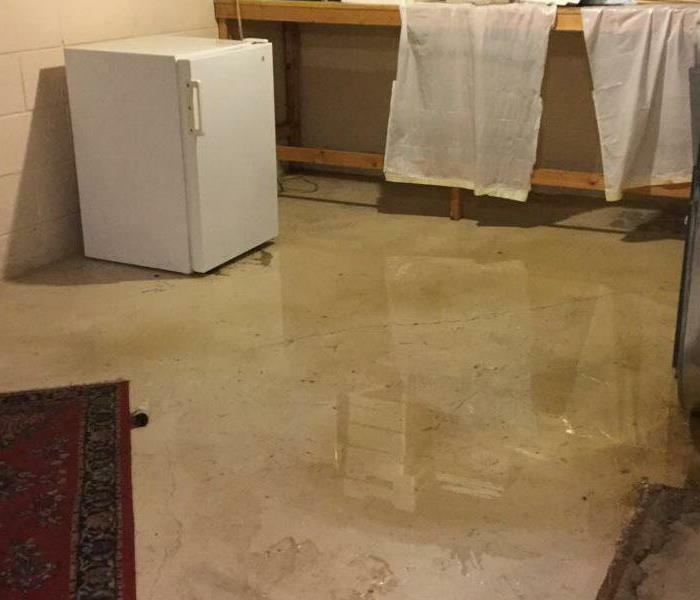 This kitchen suffered from water damage after a storm. There was a leak in the ceiling from roof damage. SERVPRO responded and removed drywall, repaired the roof, and used drying equipment to ensure home was back to normal. Mold damage was found in this Wright County attic. The team at SERVPRO responded and used special cleaning techniques and equipment to clean the area properly. Contact us for your Mold Remediation at (763) 295-1161. After a pipe break in the ceiling water collected and eventually busted causing a small flood in this home. 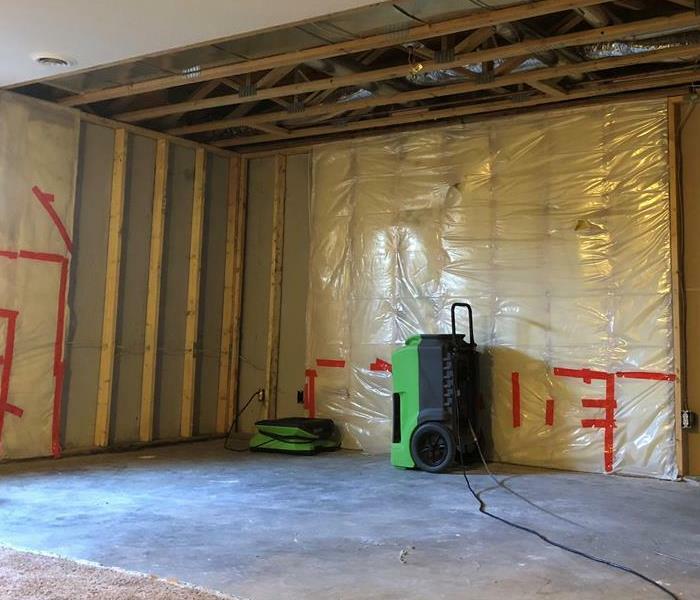 The flood cuts were performed to dry the walls and air movers put in place to dry the surrounding area. Who to contact after a storm in your area? SERVPRO has the trained expertise and professional equipment for any type of storm damage. The team is ready to respond 24/7 day or night. If your in need for restoration assistance contact us at (763) 295-1161. This home suffered from storm damage. 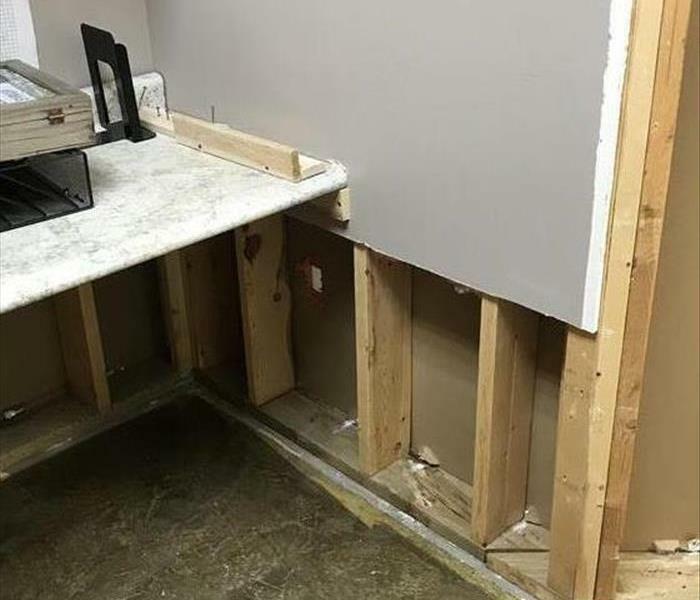 The drywall and flooring had significant water damage from the rain water. SERVPRO responded immediately to the home to access and begin the rebuild process. 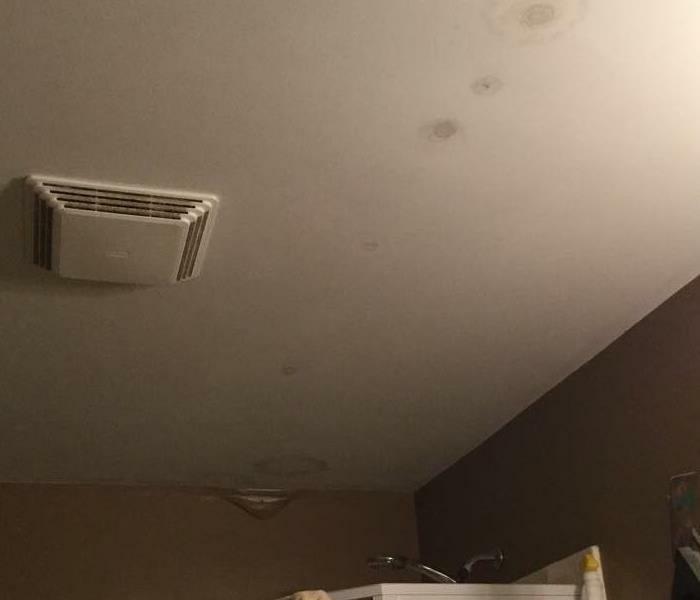 What to do if my ceiling has water damage? 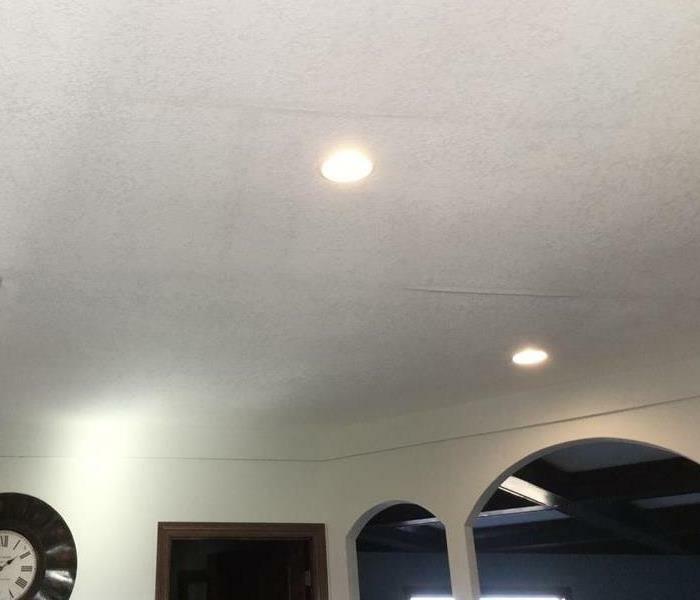 If your home has ceilings that are starting to show water damage it is important to call SERVPRO of Wright County immediately. They will get on site to make sure all of the water is removed and the source is contained. Once the source is contained, they drying process can begin. How to dry wood floors after a water loss? If your home has wood floors and they get damage from water, it is important to contact SERVPRO of Wright County immediately. 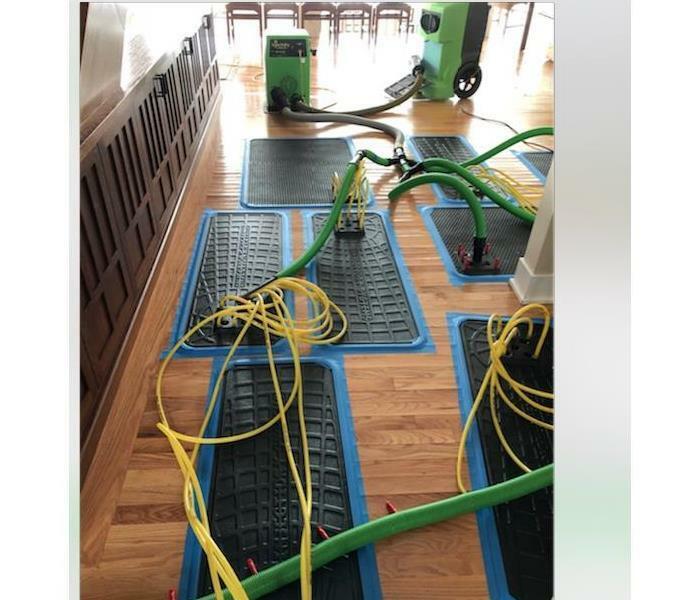 We have drying mats and other special equipment that can help extract all of the water before it causes too much damage. This home suffered from mold damage found while drywall was being tore out after water damage. SERVPRO of Wright County responded immediately to begin remediation. For all your mold and mildew concerns contact us 24/7 at (763) 295-1161. This laundry room suffered from mold and mildew damage on the floors and walls from water damage. The drywall and flooring was tore out. SERVPRO responded to clean and treat the mold and mildew professionally. This ceiling suffered from significant amount of drywall damage after a storm. SERVPRO responded and tore out the ceiling, replaced the drywall and restored to pre storm conditions. 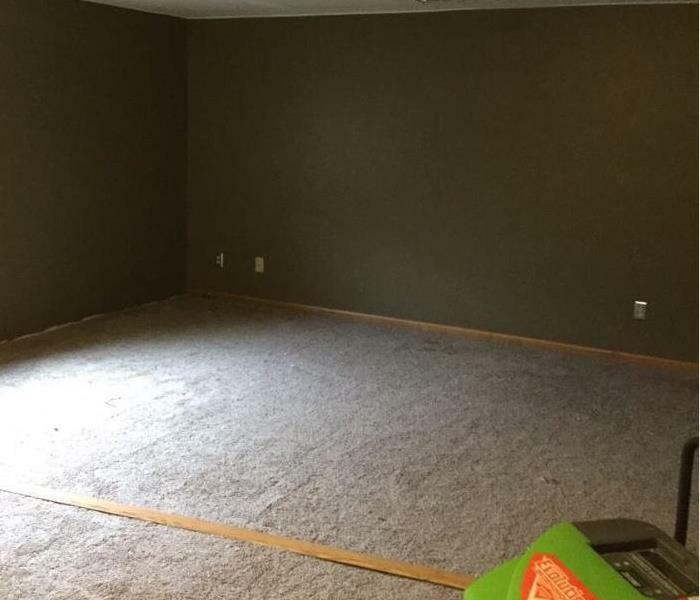 The owner was impressed with how quick SERVPRO was able to restore their home. 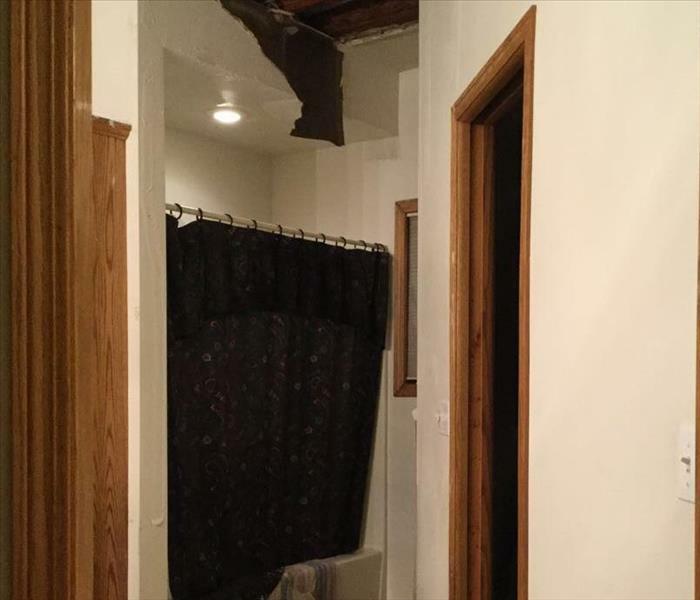 This was the aftermath of a bathroom after storm damage. 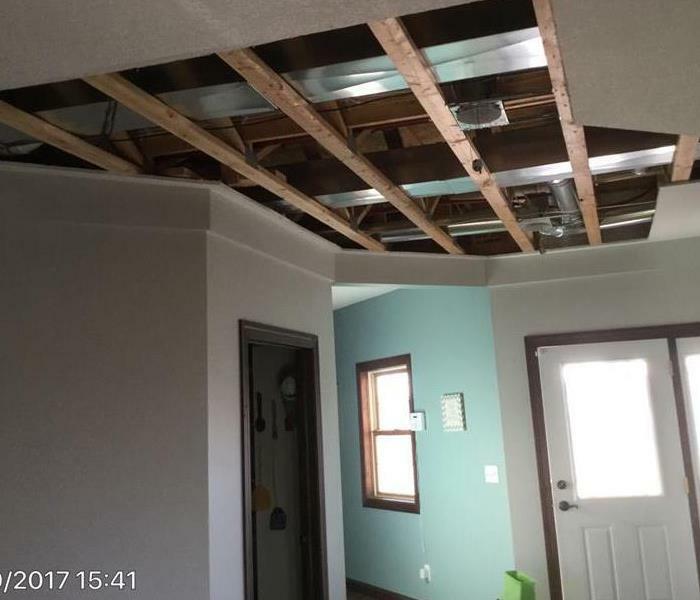 The ceiling drywall had water damage from a roof leak. 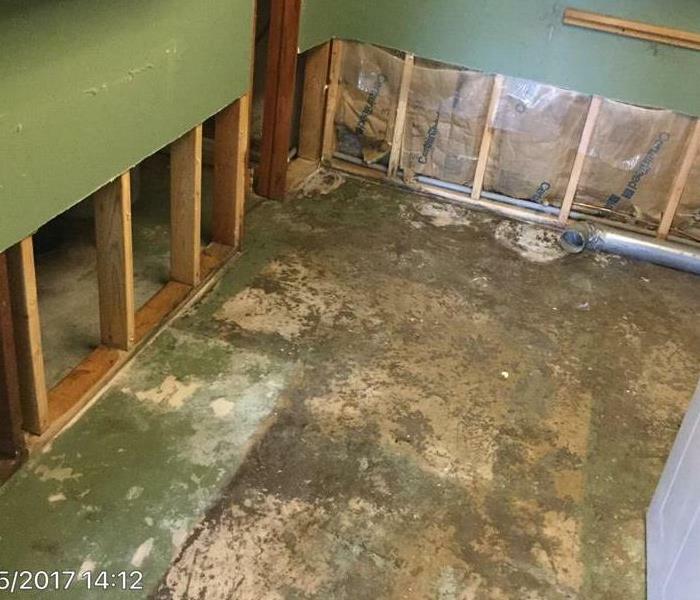 SERVPRO responded immediately and began restoring the bathroom to normal conditions. 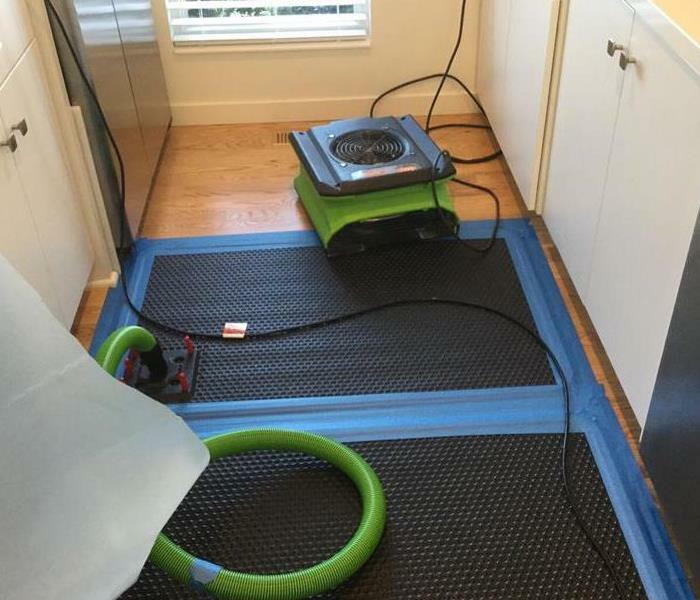 The team at SERVPRO has professional drying equipment for all types of restoration emergencies. If you have an emergency contact us anytime 24/7. The team responded to this home and were able to clean up after a water loss with little hardwood damage. This drying system was used after a water loss to the home. The technicians at SERVPRO responded immediately and began mitigation. 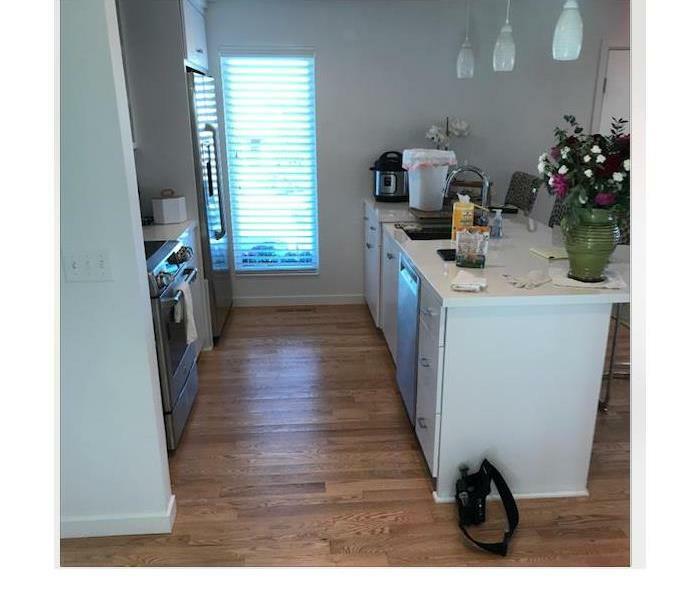 They were able to dry the floors quickly to ensure damage to the hardwood was minimal. SERVPRO responded immediately to this condo after a fire. There was significant damages to the entire home. The technicians began clean up procedures, tearing out ceiling and restoring back to normal conditions. 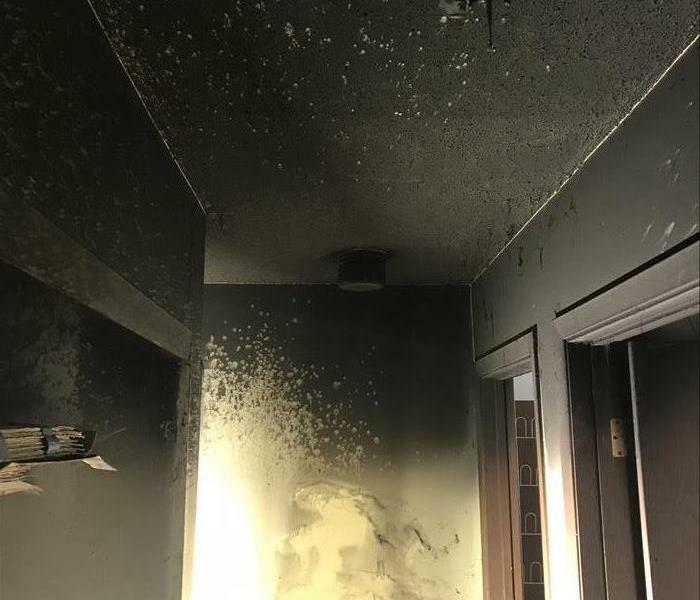 There was significant smoke and soot stains and fire damage after a condo fire. 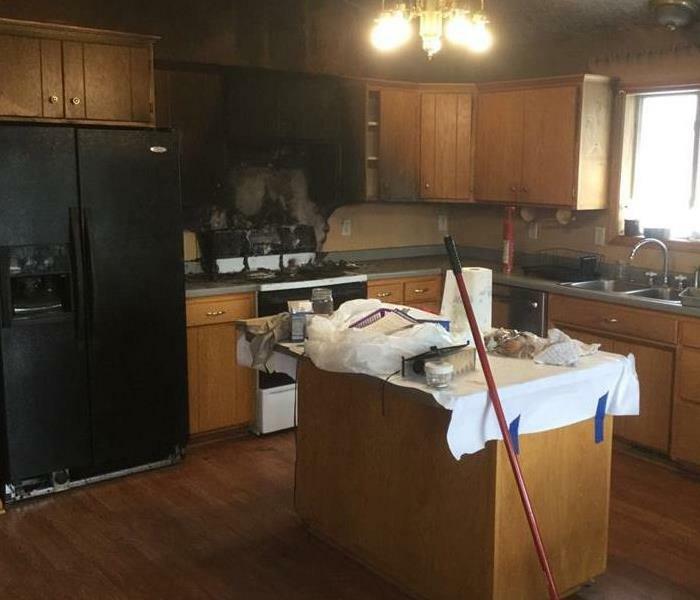 SERVPRO has professional cleaning techniques and procedures to restore this home back to pre fire conditions. Contact us anytime 24/7 for your fire restoration emergency. This is the aftermath of a fire in a condo living room. The home suffered from signifiant smoke and soot damage. SERVPRO was able to respond and clean the damages from the home. If you have flooding from a storm, call SERVPRO of Wright County. We are available 24 hours a day, 7 days a week to respond to your call. We are faster to any size disaster. After a severe storm hit the area, this home suffered from storm damage in the utility room. There was water damage to the floors. SERVPRO came in and extracted the water and dried the floors professionally. This home suffered from a water loss. 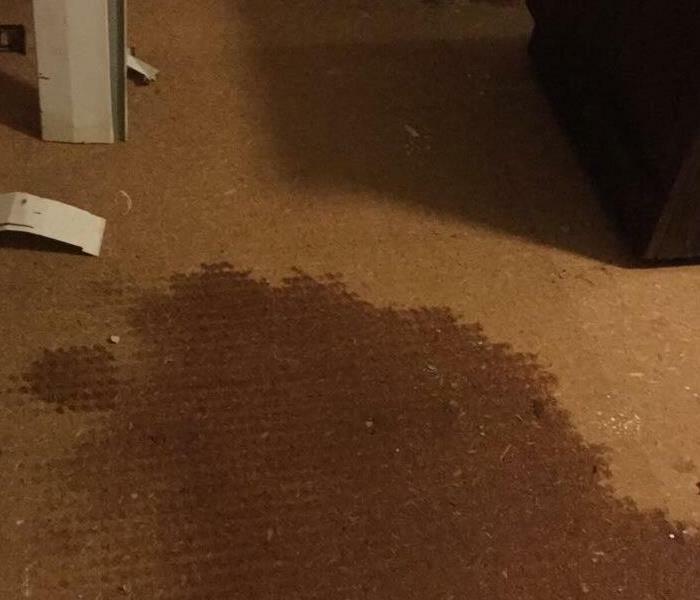 The carpet was saturated with water. SERVPRO of Wright County responded and dried the area quickly to prevent future damages. Contact us for your restoration emergency. 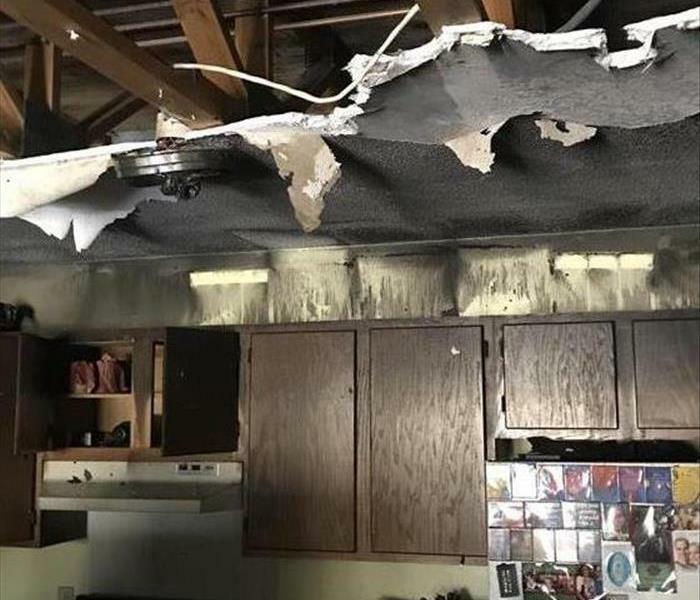 This is the aftermath of a kitchen fire. There was significant smoke and soot damage. SERVPRO responded quickly. They cleaned the stains professionally and restored back to pre fire conditions. Contact us for your restoration emergency 24/7. 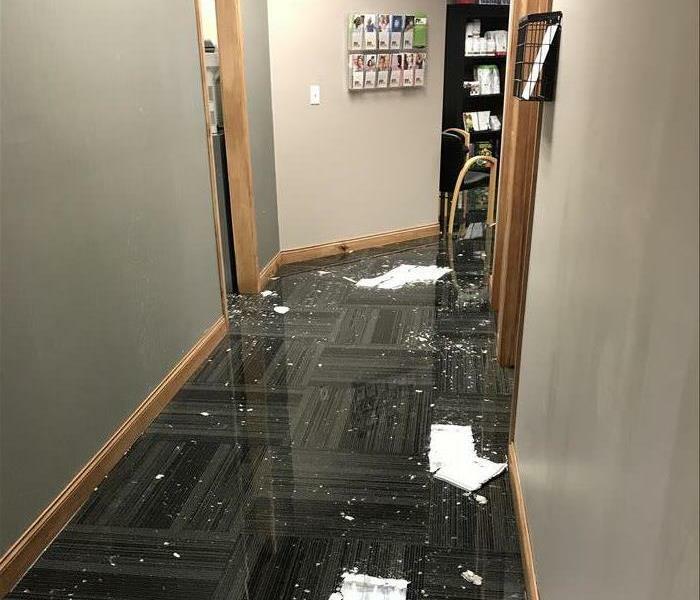 SERVPRO of Wright County was called to handle this large water loss in a commercial facility. Once on site, they quickly extracted all of the water. 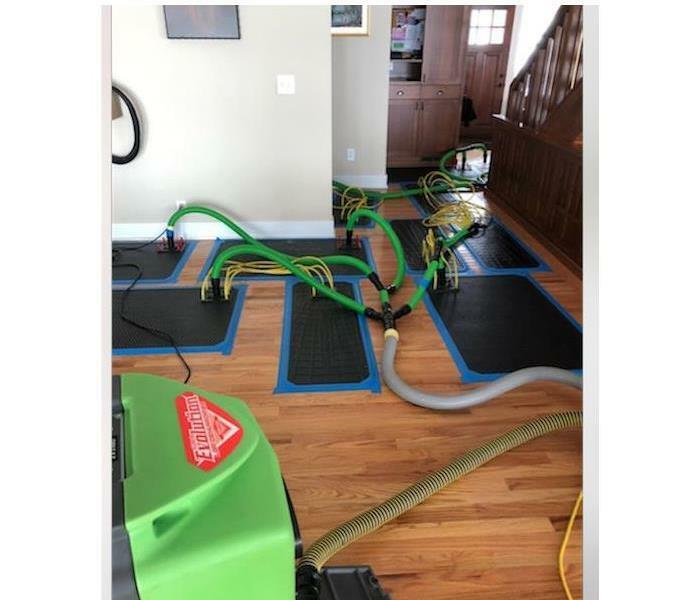 After all of the water was removed, SERVPRO placed green drying equipment and did appropriate flood cuts. This facility had a massive amount of water damage. SERVPRO was called to quickly get on site and begin the extraction process. Once all of the water was removed, we placed drying equipment throughout the facility. Pipes can freeze and cause significant damages to your home. SERVPRO of Wright County is available 24/7 to help remove and dry any water damage you have in your home or business. Let us know if you have any questions. SERVPRO of Wright County responded to this fire loss. Our team quickly got on site to begin the mitigation process. We are able to handle all deodorization and cleaning of content. If you have any questions, feel free to contact us at anytime. SERVPRO of Wright County responding to this water loss. We quickly cleaned up all of the water and got equipment in place to complete the drying process. If you have any questions, feel free to reach out at anytime. It only takes a small opening for soot to travel into areas of an attic or interior walls during a fire. This photo is an example of how much soot got into the attic above the office area of this shop fire. The top side of the batt insulation is completely black. 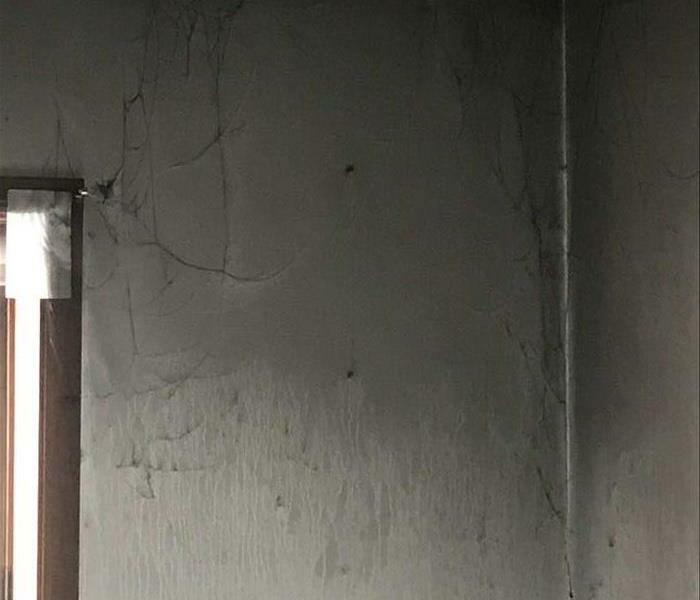 This photo shows just how much soot can can be produced from even a small fire. Note how black the steel panels are on the walls and ceiling along with the shelves and contents. This auto/trailer repair shop had a vehicle start on fire inside the shop that caused significant soot damage throughout the shop and office area. This is a photo of one of the parts areas. 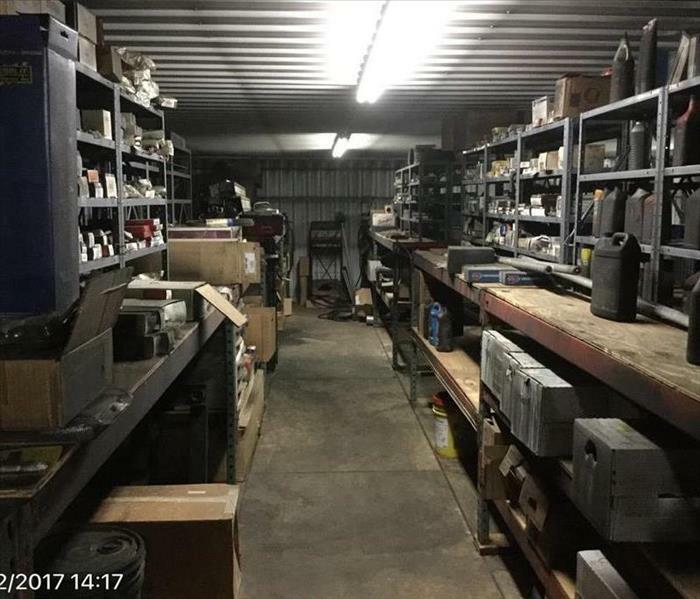 SERVPRO of Wright County worked with the customer to clean any salvageable parts or create a comprehensive inventory list for parts that were deemed non-salvageable. 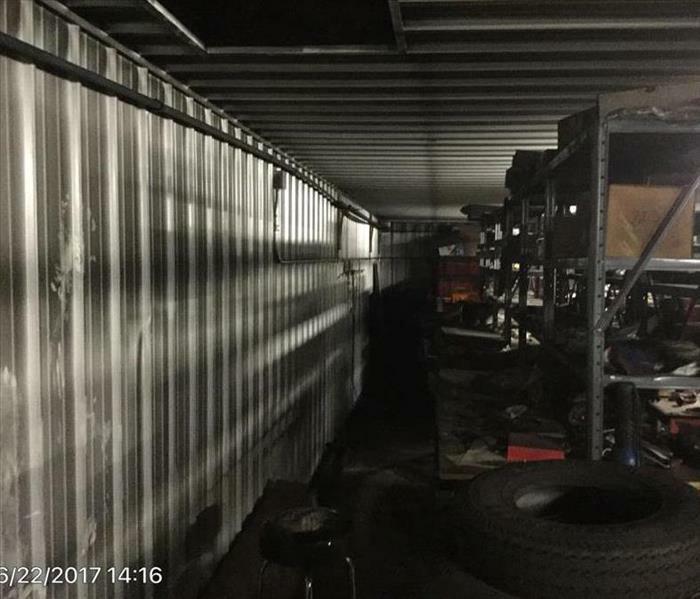 This auto/trailer repair shop had a vehicle start on fire inside the shop that caused significant soot damage throughout the shop and office area. 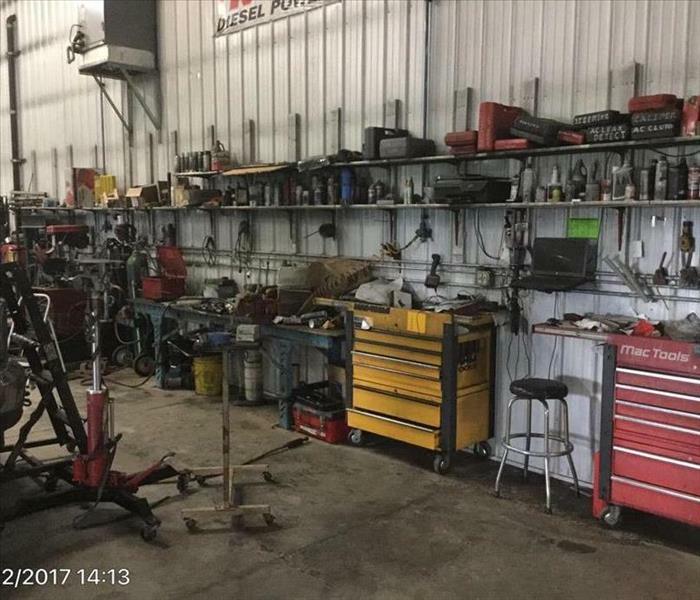 Notice the soot on the walls and all of the tool cases and tools. 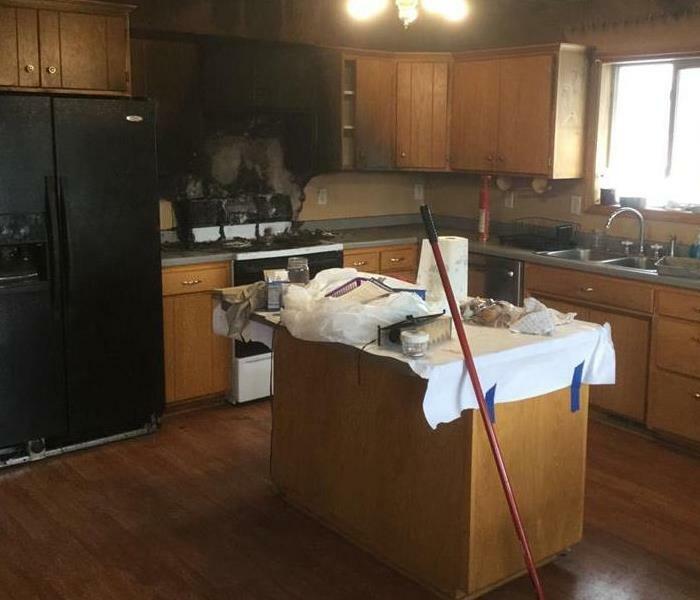 SERVPRO of Wright County worked diligently to remove all of the contents and conduct a thorough inspection to determine if each item was salvageable. 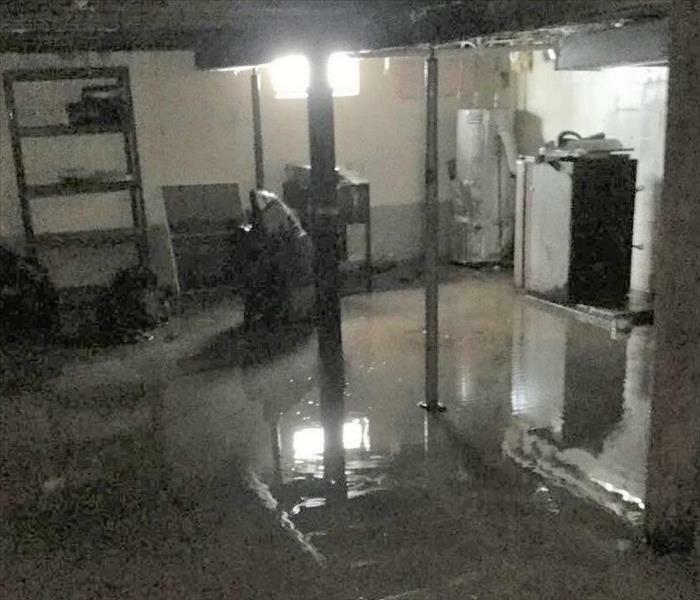 An area home suffered a large water loss in the basement that left several inches of standing water. SERVPRO of Wright County responded immediately to extract the water and minimize additional damage. 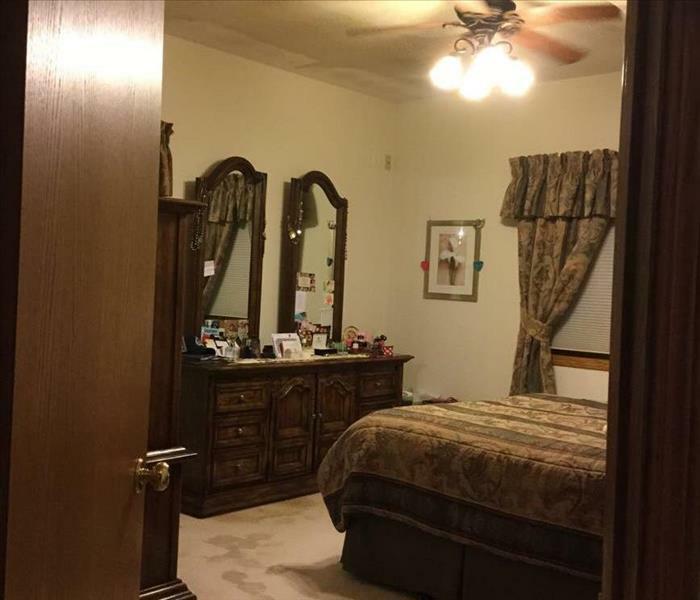 An upper level water line break caused damage throughout this lower level bedroom. The room is saturated from the ceiling all the way to the floor. SERVPRO of Wright County provides 24 hour service for any water damage to your home or business. Call us at 763-295-1161. 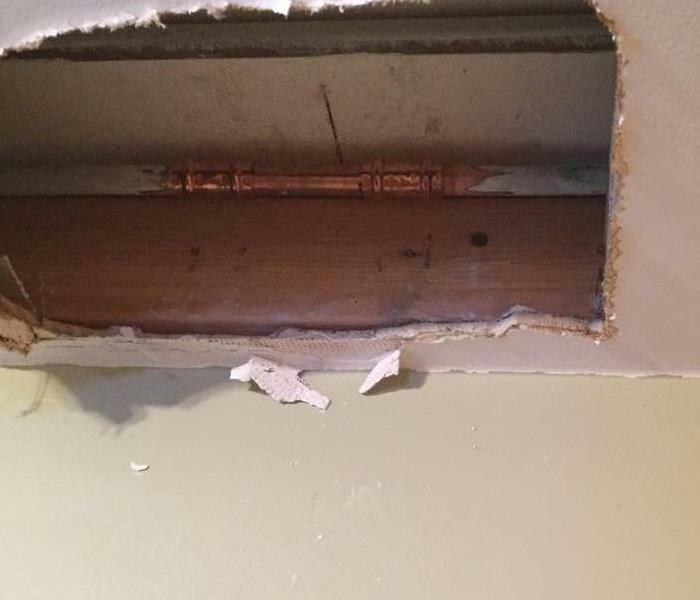 A water line to the toilet burst in the bathroom in the upper level of a home. This picture shows how we found the bathroom on the level below when we arrived. The drywall ceiling was completely knocked down by the large amount of water from the floor above. These cabinets have sustained water damage and also have significant visible mold. 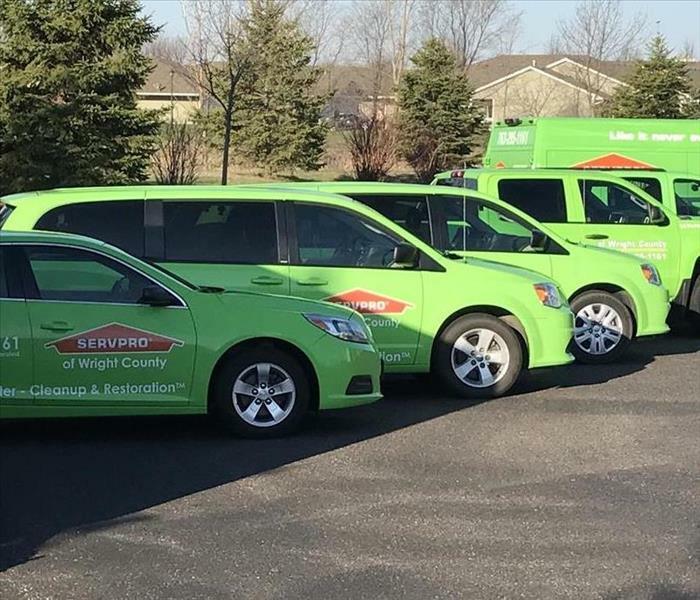 If you suspect mold in your home or business, please contact SERVPRO of Wright County at 763-276-0375. This is an example of how extensive mold is able to grow in an environment with plenty of moisture and high humidity. SERVPRO of Wright County is able to service all of your home or business mold remediation needs. SERVPRO of Wright County is proud to be an active member of the Monticello Chamber of Commerce. We provide 24 hour emergency service for water or fire damage throughout the area. Unfortunately, this home suffered a water loss that wasn't found for several days. 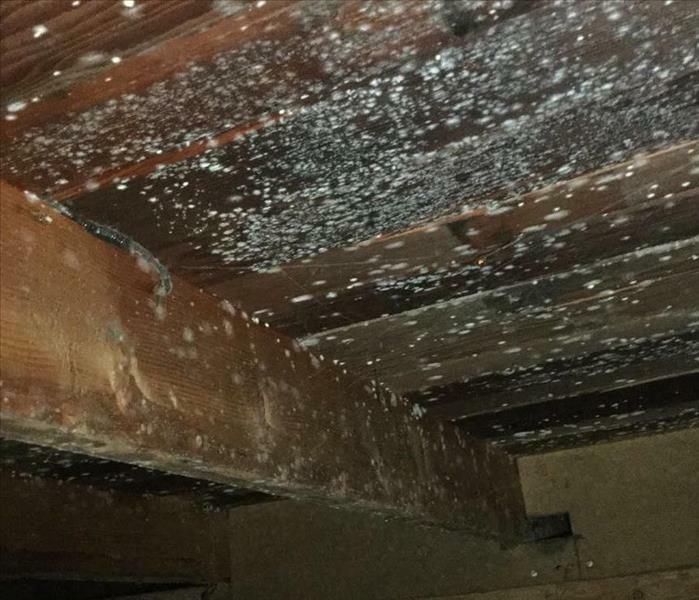 Mold began growing on the floor joists in the crawl space. 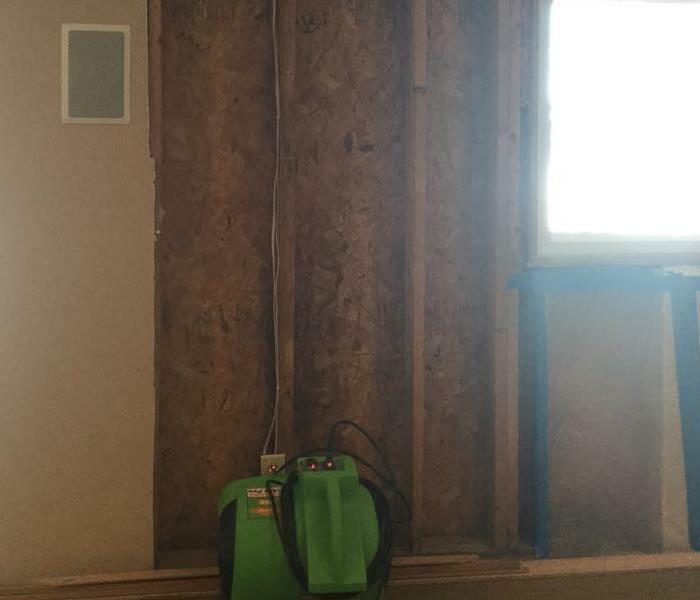 SERVPRO of Wright County was able to not only dry out the structure, but also remediate the mold and get the home back to a safe living environment for the family. There are some contents that can be salvaged and others that cannot after a water damage. These moldy mattresses are the result of waiting too long before removing water after a pipe break. Once it is moldy it must be replaced. However, calling a restoration company sooner could have cleaned and restored these items before the mold had time to grow. After a fire it is important to use a board up service to assure your home is not looted while you are away. SERVPRO of Wright County has a dedicated board up crew to respond quickly to fire losses keeping your home safe and secure. Wood floors are easy to dry if you have the right tools. 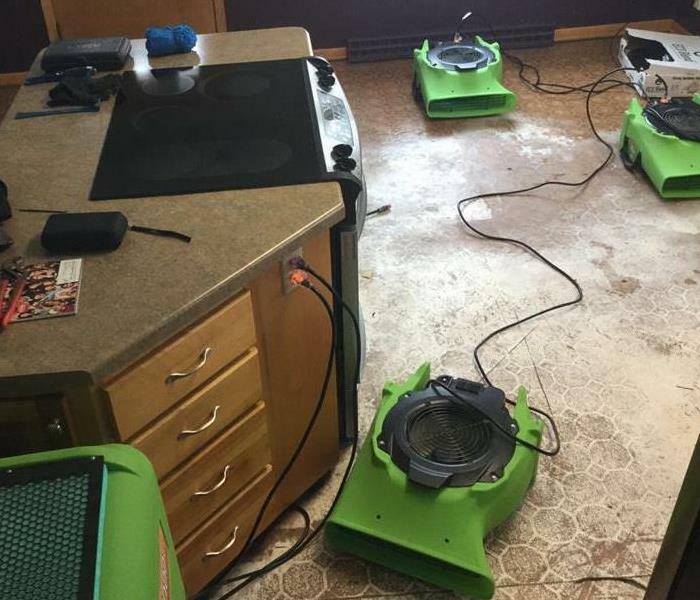 SERVPRO of Wright County has a system to dry out wood floors after a broken supply line or pipe break. The main key is to start the drying process as fast as possible. We respond 24/7 and quickly to get the job done! This is the aftermath of an apartment fire in Montrose when the building was released to us to begin the mitigation and restoration process. 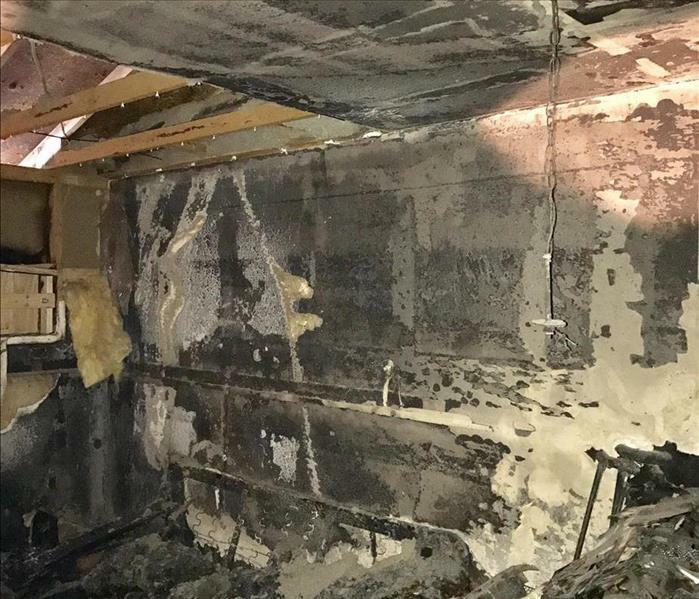 There was significant smoke and soot damage in a majority of the building, but our teams jumped into action and worked tirelessly in an effort to restore the property as quickly as possible and allow the tenants to return to their homes. Part of our fleet of vehicles ready to respond to your emergency needs 24/7. Whether you're facing water damage, fire or smoke damage, or mold concerns, we are here to serve you. Call us at 763-295-1161. We make disasters "Like it never even happened." Our storefront location in Monticello where our vehicles and equipment are housed. We are ready to respond to your residential or commercial water loss, fire and smoke loss, or mold remediation project anywhere in Wright County. Give us a call at 763-295-1161 anytime of the day or night and we will respond to your emergency needs. We make disasters "Like it never even happened."